Starting November 1, New Jersey will join two other states (Hawaii and California) and cities (New York, some communities in Massachusetts) in making it illegal to smoke cigarettes (or vape) until you’re 21 years of age. Smoking is, of course, terrible for you, but does raising the legal smoking age to 21 actually stop smoking, or is it just another oppressive government move to regulate our vices? Let’s look at the data. Generally, laws that let “adults” drink, smoke or vote in this country are based off the fact that we decided that the age of majority — or legal adulthood and responsibility — is 18. That’s roughly because we assume teenagehood ends around 18 or 19; at least, compulsory schooling does. That’s admittedly somewhat arbitrary, but laws that restrict drinking and smoking work off this assumption of adulthood. The current argument to make kids wait until they are 21 to smoke is that it saves lives. A 2015 study from the National Institute of Medicine looked at three possible ages to restrict smoking to beyond age 18—to either 19, 21 or 25—and concluded that making kids wait until 21 to buy smokes was the best bang for the preventive buck. For those born between 2000 and 2019, raising the legal smoking age to 21 would mean 249,000 fewer premature deaths annually, they projected. It would also net 45,000 fewer lives lost to lung cancer. But why age 21 instead of 19 or 25? The researchers note that 21 is a better age to restrict to for a number of reasons. First and foremost, most people who smoke every day say they started before age 19, whereas a full 100 percent of smokers have picked up the habit by the time they’re 26. That might make it seem like age 25 is the safest bet, but most 15 to 17 year olds who start smoking get cigarettes from friends or relatives who are of legal age to buy them. 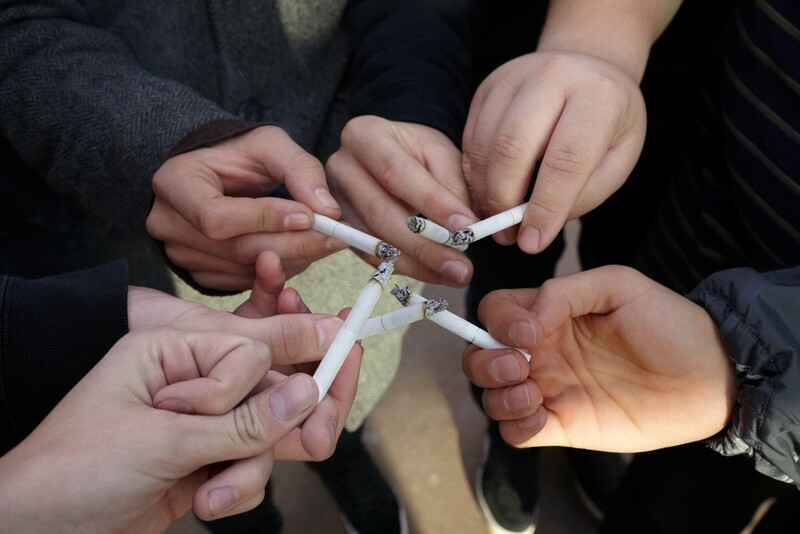 When the legal age is 18 or even 19, in other words, young would-be smokers still have an easy supply of legal smokers in their social circle from whom to obtain cigarettes. Raising the minimum age to 21, researchers argue, puts those would-be teen smokers out of the age of legal smokers, making it harder to bum smokes from friends. Raising the smoking age to 25 doesn’t make as big a difference because it doesn’t have the same ability to reduce access to cigarettes at the key age when a majority of kids are most vulnerable to smoking in the first place. When Needham, Massachusetts, for example, experimented with raising the legal smoking age to 21, high school teen smoking rates dropped nearly in half compared with other communities nearby that maintained the 18 age restriction. Now 100 communities in the area have adopted the 21 standard. There’s a lot of support for the measure. Currently, seven in 10 of all adults support raising the smoking age to 21, according to the CDC. Three quarters of former smokers support it — which you’d expect. But so do 69 percent of current smokers. That means most people who actually smoke now don’t think it should be so easy to start, either. All this seems like a slam dunk for youth smoking prevention, but smoking, like drinking, voting and fighting in wars, tends to be lumped into the argument that if you can be sent to die, you ought to be able to smoke a cigarette. That’s often coming from Big Tobacco and libertarian-leaning freedom types who say it’s a slippery slope to restrict anything past the age of majority, or 18. “If saving lives is the ultimate goal of public policy, then in addition to disenfranchising younger adults from buying tobacco products, shouldn’t we revoke the driving privileges of all senior citizens over the age of 70, given that group’s increased likelihood for accidents?” a reader wrote to The New York Times in a collection of responses to an op-ed supporting raising the smoking age to 21. Writing at the L.A. Times, Mike Males, a researcher for San Francisco’s Center on Juvenile and Criminal Justice, argues that no specific statutory assistance is needed in stopping teens from smoking. Instead, making it illegal to smoke in public and raising taxes is effective enough. He’s not wrong: About 15 percent of all adults in the U.S. are smokers, and that’s been steadily declining for two decades, in large part due to higher cigarette taxes. But other factors, too, have been keeping this number down, including public bans, smoke-free workplaces and increasingly negative attitudes toward the tobacco industry. But for teenagers, it may not be taxes, age restrictions or other anti-smoking measures that impact whether or not they smoke as much as one big thing: the movies. Teenagers who see smoking in films are two to three times more likely to start smoking, even when controlling for other factors, like whether your parents smoke, socioeconomics or attitudes. Which is why whether or not a teen sees smoking on the big screen is considered the “largest single stimulus” for teenagers to pick up smoking, proving true in a study of 17 different countries. This is troubling because tobacco use on screen has increased by 72 percent between 2010 and 2016 in all films, and 43 percent in those rated PG-13. For comparison’s sake, raising the drinking age saved lives, too. That happened in 1984, when the minimum drinking age was 18, but most drunk drivers were aged 18 to 20. After the drinking age was bumped up to 21, fatal crashes in that age group dropped significantly: In 1982, 61 percent of crashes involved young drivers; by 1995, that figure had dropped to 31 percent. But not everyone supports keeping the drinking age at 21, either. The Amethyst Initiative, a group of college and university presidents, wants it lowered to back down to 18 again, claiming that having to be 21 to purchase alcohol hasn’t stopped young adults from drinking too much. If anything, it’s fostered binge drinking and driven drinking underground where colleges and universities can’t instill a culture of responsibility and moderation in underage drinkers on their watch. “When it is legal for an 18-year-old to drive, marry or serve in the military but illegal for him or her to drink a beer, the illogic of the situation is patent,” the president emerita of Kenyon College, S. Georgia Nugent, wrote in The New York Times in 2015. Some argue that we should lower the drinking age to 18 but move the driving age back up to 21 to keep those DUI fatalities as low as they currently are, proving these policies are an endlessly shifting kaleidoscope of logic depending on the values at hand. If we really picked an ideal age to wait to drink or smoke to live our healthiest, best long lives, that age would be never. A recent study published in Health Affairs looked at the lifestyles of 14,000 people, beginning at age 50, to see what factors most contributed to a longer, disability-free life. Those who had made it that far without doing three things were guaranteed longer, better lives: not being obese, not drinking more than 14 drinks a week and not smoking. Trouble is, some 80 percent of Americans were obese, smokers, or obese smokers by this age. Of course, this doesn’t mean we shouldn’t try to prevent smoking and drinking as long as possible. If anything, it probably means we still aren’t doing anywhere near enough. But it also proves that no matter what we do, most of us are determined to live the unhealthy, ill-advised lives of our choosing—we’re just divided over at what age, exactly, we should be allowed to start.